This study reports Agrobacterium rhizogenes-mediated transformation of three cultivars of Ocimum basilicum for hairy root establishment, screening and selection for the production of rosmarinic acid and antioxidants. Hairy root development was found to be explant-specific and virulence-dependent. Distinct inter-cultivar morphological variability was found between the seven axenically developed hairy root lines and morphological traits were found to be correlated with the presence of aux2 genes, their expression and endogenous IAA content. 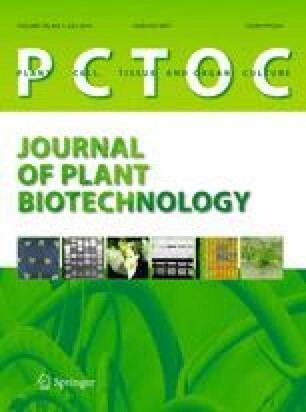 Further inter-cultivar variability in the content of total phenolics, rosmarinic acid and caffeic acid was also found. Production of rosmarinic acid was found to be age-dependent and cultivar-specific. Chemiluminescence analysis showed the hairy roots to be rich in antioxidants and that rosmarinic acid was the major antioxidant molecule. The concentration of rosmarinic acid was found to be positively correlated with the total antioxidant potential of the hairy root extracts. On the basis of origin, morphology and metabolite content, three elite hairy root lines were selected that had significantly higher rosmarinic acid production, biomass and antioxidant potential than non-transformed roots. These new lines are rich reserves of both antioxidants and rosmarinic acid. The online version of this article (doi: 10.1007/s11240-016-0973-x) contains supplementary material, which is available to authorized users. We acknowledge Dr. Pushplata Singh for assistance with primer design and Ms. Deep Rajni for HPLC analysis. Infrastructure support provided by TERI, India and Deakin University, Australia is also duly acknowledged. Deakin University provided a postgraduate scholarship to SS. This study was funded by Deakin University, Australia. DC and AA conceived the work and provided comments on all drafts of the manuscript. XC provided technical expertise on total antioxidant and individual antioxidant chemiluminescence analysis. SS designed and carried out all the experiments, analyzed the results, prepared all the figures and tables and drafted the manuscript.